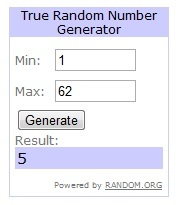 6 Months Celebration GA WINNER - Be Glossy In and Out! 6 Months Celebration GA ended and although this time I didn`t have many participants as I was expected cause of the attractive award, I am very glad cause there were exactly the persons who are constantly reading my blog and they are also active on FB. We had 64 entries, 7 from those were not legit, 2 were disqualified and 3 persons had double entries, so I had to chose only one. And the winner is... Mirela Agrigoroae!!!!! Congratulations!! I will contact you by mail, in case you don`t respond in 48 hours, I will organize a new extraction. E-mail me Glossy Lala, you can find my e-mail address at the bottom of my blog. Thanks for the sweet comment! I'd love it if you'd publicly follow(: If you're in the US enter my giveaway! If not you should still share it with friends! I'm your new follow and I await your follow ! You ave a nice blog ! Felicitari Mirela,sa o folosesti cu drag! Thank you for the comment on my blog! It would be great if we could follow each other, I agree! Thank you for the comment you left on my blog, of course we can follow ech otther, please follow me and i will follow you right back. Multumesc frumos!Acum am azut si am trimis datele. I followed you on GFC, FB, Twitter, Bloglovin. Hope you do the same. Thanks for visiting my blog :) Sure I would love to follow each other! Following already! Thanks for comment! Of course I want to follow each other! I'm following You now on GFC and wait for You!. I follow now, follow back? Hello! Thanks for your comment on my blog, I'm following you now, for pleasure waiting for follow back?? :) Kisses! would you like to follow eachother with gfc? Hey, yes I'm Greek :) I work in Kalamata but i'm from Crete! Congrats on your sixth month honey. Thanks for your comment. Of course I'd love to follow each other. I'm following now. Thanks hun, I followed you also! !